Having clean windows is essential if you want to continue getting unobstructed views of the outdoors. However, the task of cleaning windows isn’t exactly for everyone. Window cleaning requires patience and precision, and you must be armed with the necessary window cleaning equipment to complete the job properly. If you don’t have any of those, maybe it’s best to have your windows cleaned by window cleaning professionals, like us at Valor Janitorial. If your property has many windows, it will take hours to clean your window panes. However, a professional window cleaning company has the manpower to clean all your windows simultaneously – significantly cutting the work time. Additionally, window cleaning isn’t just a time-consuming task, but it can be dangerous as well. Properties that have high windows require long cleaning tools or a tall ladder to cover every inch of the glass. However, if you aren’t careful while cleaning your windows, then you can slip and fall. Let us handle your hard-to-reach windows instead, so you can be put out of harm’s way. When dust, dirt, and other debris are left on windows, they can harden and seem impossible to remove. This can cause scratches on the glass and eventually distort your views to the outdoors. Heavily damaged windows have weaker compositions and don’t last long. Thankfully, professional cleaners can restore your awful windows with a good cleaning process. Professional cleaners are armed with high-powered tools that can get rid of even the toughest stains, but are delicate enough not to damage your windows. They can even treat your damaged windows with specials cleaning tools and products, extending your windows’ lives even further. Window cleaning professionals can spot current and early signs of window damage. This gives you the opportunity to have your windows repaired sooner. Repairing your windows before the damage gets worse saves you from spending too much on repairs. At Valor Janitorial, we have the experience and equipment to make your windows look as good as new. With professionally cleaned windows, you can expect your property’s curb appeal to increase. Professionally cleaned windows also help homeowners who are planning to sell their homes. When house hunters see that the windows are crystal clear, they have an easier time falling in love with the property. 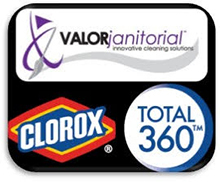 If you’re looking to have your windows in Dallas, Texas, professionally cleaned, contact Valor Janitorial. We offer excellent window cleaning for all types of commercial properties, as well as reliable janitorial services and office cleaning. Give us a call today at 214-238-9550 for a free estimate.